Coming home to comfort. We all want that. Among the many important home features are: Privacy, Proper Lighting, Presentation and a Comfortable Temperature. Residential Window Film is an easy, effective and economical way to improve your home. It is far more efficient, flexible and cost effective than replacing the glass in your home. Among the issues residential window film can resolve are: Updating faded glass, improving the look of your home, decreasing glare from too much sun in the wrong place, protecting you and your family's privacy, added security and lowering your energy bills. All of our Toronto Home Window Film is available in inexpensive and easy to install packages. 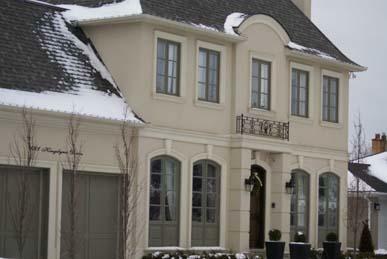 Insulating Window Film - Keeps heat out in the summer and in during the winter. Saves money, especially as global warming increases the need for air conditioning. “Static Cling Film”, which is excellent for this use, is reusable and can block up to 99% of the harmful UV rays of the sun. These films should be added to the inside of single panes and to the outside of dual panes. Decorative Window Film - Enhances the look of the home, makes the view more appealing, leads to increased pride and a better price if you should want to sell. UV Protection Window Film - Protects your furnishings from the harmful effects of ultra-violet light, which causes fading and sun damage. Hot summer glares can cause your home furnishings to look dowdy and faded by the end of even one summer. Privacy Window Film – Allows one to see outside while protecting from curious eyes outside. We offer a wide selection, including Black Static Films, Frosted Window Films and Mirrored films, as well as professionals to guide you to the best solutions. Perhaps the most important aspect of using these residential window films is finding a qualified, reasonable provider and installer. We can certainly help with that. The Total Solar Energy Rejection Rate measures the ability of the film to keep out harmful UV. Infra red and heat glare. Ask the store assistant to give you films with a higher solar energy rejection number. The Light Transmission Ratio lets you know how light/dark the film is going to look after installation. A lower percentage means a darker screen. Screens which have a ratio of around 49% will offer an ideal balance of comfortable visibility. The Ratio of Visible Light being Reflected by window film is called its “Reflectance Capacity.” The higher the light reflectance capacity, the shinier your window surface will look. The “Shading Coefficient” gives the net benefit of a window treatment. We offer the widest selection of window film, at an affordable price. Call now for worry-free service and a free estimate. Window Tinting Services is based in Toronto, Canada and serves the GTA, including Ontario cities such as Concord and Vaughan. In addition to Residential Window Film, we also feature Toronto Commercial Window Film and Tinting, Security and Safety Window Film, Anti-Graffiti Window Film, we are a Wholesale Window Film Distributor, and we offer a Window Tinting School and Courses for those wanting to start their own window tinting business.